The Amish pay a lot of attention to quality and detail when they make their products. Everything possible is made of solid hardwood, and built with the intention of being handed down for generations. 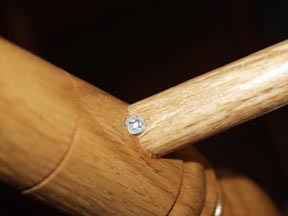 As you can see in these photos detailing the construction of our oak bow back chairs, the Amish builders assemble all of the joints with a tight fit, glue them, and then take it a step further by adding screws where they can. This quality of construction is typical of everything we sell. 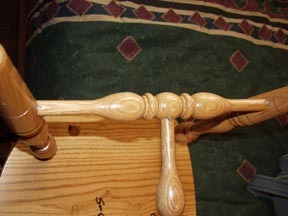 The photo above shows how the chair supports are screwed together at all the major joints. 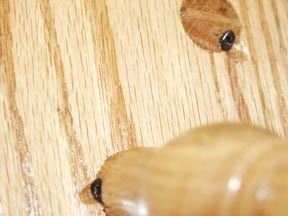 The photo above is a close-up of the joint between one of the legs and the side support. The photo above shows the screws that anchor the top of each leg to the bottom of the seat (underneath), and also the screws that anchor the bow back to the seat bottom (also underneath). 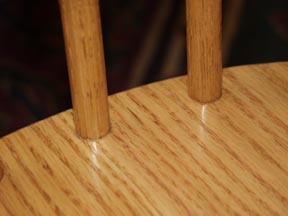 This photo shows the tight fit and quality of construction where the chair back uprights are secured to the chair bottom. All photos on this page are originals, and Copyright 2004 by Don Bruechert.